Movement Capital’s hedge model buys puts on the S&P 500 when the trend or macro models are out of the market. The goal of the hedge model is to further reduce stock losses when there’s a high probability of a substantial correction. This is the most technical model and is optional for Movement clients. It is only run for investors that both understand option contracts and the construction of the model. People buy insurance for valuable assets like their home and car. Investment portfolios are typically one of an investor’s largest assets, yet investors rarely buy protection for their portfolio. When you’re protecting your portfolio, you’re primarily concerned with equity risk. Bonds are less volatile since future cash flows are more certain. The hedge model is focused on hedging extreme “tail risk” events and not routine 10% stock corrections. The majority of market risk models are based on a normal distribution, which implies that financial market returns are evenly distributed. Basically, a normal distribution says that an equal amount of really bad and really good things will happen. History has shown that market returns are not normally distributed. The image below shows that significantly negative S&P 500 monthly returns (in blue) have occurred more frequently than what the normal distribution (in red) would predict. The next section dives into the hedge’s structure. You might find this guide helpful if you’re not familiar with options. Underlying Instrument: The hedge model uses SPY, the most liquid U.S. ETF, as the underlying instrument to hedge. SPY tracks the S&P 500 index and is highly correlated to the equity risk the hedge model is concerned with reducing. U.S. and international stocks have historically exhibited stronger correlation in down markets. As Ben Carlson has pointed out, correlations between risky investments all tend to go to one during corrections. Additionally, SPY options are more liquid than options on international stock ETFs. This translates to lower trading costs. Option Strike Price: Movement uses 10% out of the money puts. For example, if SPY is $280 per share, a $252 put is 10% out of the money since it’s 10% below the underlying’s current price. There’s a trade-off to make when choosing an option’s strike price. Out-of-the-money puts are less expensive since the underlying has a lower probability of trading significantly lower. In-the-money puts are more expensive since the underlying is already trading below an in-the-money option’s strike price. In-the-money options behave more like a direct short stock position and have a fairly symmetric payoff profile. In contrast, out-of-the-money options have a more asymmetric payoff profile, with gains typically being an order of magnitude bigger than losses. This is because out-of-the-money options are so cheap to begin with. There’s no right or wrong answer when it comes to strike selection. In general, Movement avoids in-the-money puts because due to their high delta you might as well just reduce regular stock exposure. Movement also avoids super out-of-the-money puts. If you hedge with a 30% out-of-the-money put and the S&P declines 10% in a month, you have to have exceptional timing to capture the premium explosion before the option starts behaving like a melting ice cube. 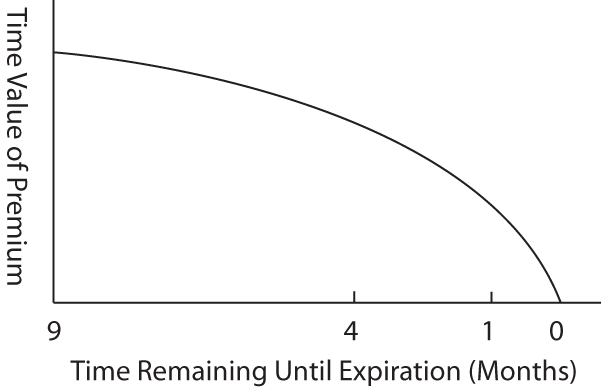 Option Maturity: When a hedge is initiated, Movement buys options with six months to maturity. An option that expires in one month will be cheap since there’s a smaller window of time for a given price move to happen (making the event less probable). On the other hand, an option that expires in three years will be more expensive since there’s a larger window of time for a price move to happen. You can see this dynamic in the graph below. Out-of-the-money options rapidly decay as they approach expiration. This is intuitive: when you’ve got less time for something to happen, the probability of that thing happening decreases, and thus the price you’re willing to pay for an option should fall. As with choosing a strike price, there’s no right or wrong answer for an option’s maturity. Movement avoids long-term (> 2 year) options since they’re expensive and less sensitive to short-term implied volatility that rises in a sell-off. Movement also avoids short-term (< 3 month) options since they have to constantly be rolled, which generates additional trading costs. To summarize the hedge model’s structure, Movement uses 6 month, 10% out-of-the-money puts on SPY. I’ve tested a number of approaches rooted in intuitive hedging criteria based on stock valuations and whether volatility is high or low. I’ve found that these approaches weren’t historically effective. At first glance, valuations or volatility make sense as hedging criteria. When stock valuations are lofty and optimism is high, the risk of future drawdowns increases since there’s more room for the future to pale in comparison to high expectations. Some investors also think that the level of volatility is a good indication of when to hedge. On the surface, this makes sense because put options become less expensive as volatility decreases. In reality, it’s tough to discern a fair value for volatility. In September 2008, the CBOE Volatility Index (VIX) was 32 – this was a very high level of volatility relative to the past. Anyone who didn’t hedge based on this seemingly prohibitively high cost of insurance regretted it in October as stocks crashed and the VIX rose to 79, making the prior VIX reading of 32 look low. History has repeatedly shown that high valuations and low volatility can persist for longer than anyone thinks possible, and this is why Movement don’t use valuations or volatility as criteria for the hedge model. Instead, the hedge model is only active when either the trend or macro models are out of the market. The trend and macro models are focused on one thing: reducing stock exposure when there’s a high probability of a large future loss. This is exactly what the hedge model is focused on, too. If either active model is out of the market, Movement takes this as a warning signal for equity exposure and employs the hedge model. The graph below shows the historical positioning of the hedge model. Movement hedges 3% of a client’s stock exposure when the hedge model is active. For example, if a client has 50% in stock exposure when the hedge is active, Movement would allocate 1.5% of their overall portfolio to the hedge model. The allocation size of a hedge is important – too small of an allocation (like 0.25%) means any potential benefit is a rounding error, and too large of an allocation (like 5.0%) introduces a large potential drag on portfolio performance if stocks do not substantially correct. For example, if an investor’s equity exposure going into Q4 2008 was 35%, the hedge would be active and 1.05% (35% * 3%) of their account would be invested in the hedge. A 1.05% allocation to something that increases 225% translates to a 2.3% gain for the overall portfolio. It’s important for a hedge to be assessed frequently. For example, say you placed a hedge on January 1 and the S&P 500 rose 20% by September 30. If the S&P fell -10% in October, the hedge would be significantly less effective since you were hedged for an equity drop from a much lower initial level in stocks. The hedge model is assessed at the end of each quarter. For example, at the end of Q3 2015, the trend model was out of the market. The hedge was then in place for the next quarter. This ensures that the hedge’s strike price is matched to current stock prices yet is infrequent enough so that transaction costs are extremely low. Click on the buttons below to navigate to the other model pages.